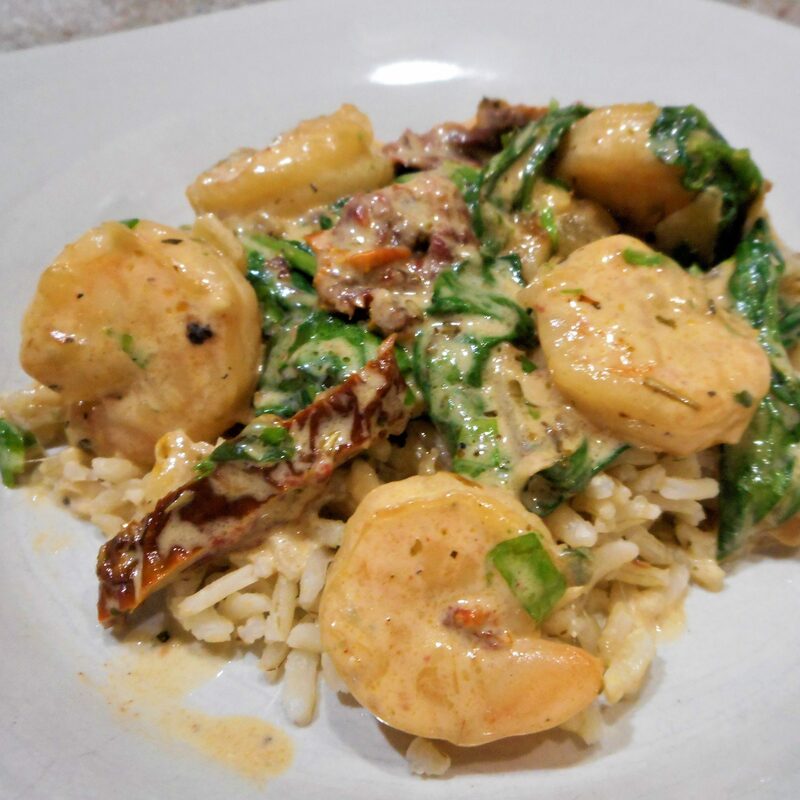 Creamy Tuscan Shrimp coated in a light and creamy sauce filled with garlic, sun dried tomatoes and spinach. 1. Heat a large skillet over medium-high heat. Melt the butter and add in the garlic and cook until fragrant (about 30 seconds). Add in the shrimp and cook two minutes on each side, until just cooked through and pink. Transfer to a bowl and set aside. 2. Sauté the onion in the butter remaining in the skillet. Pour in the white wine, and allow to reduce to half, while scraping any bits off of the bottom of the pan. Add the sun dried tomatoes and simmer for 1-2 minutes to release their flavors. 3. Reduce heat to low-medium, add the milk and cream and bring to a gentle simmer, while stirring occasionally. Do not boil. Season with salt and pepper to taste. 4. Add in the spinach leaves and allow to wilt in the sauce, and add in the parmesan cheese. Allow sauce to simmer for a further minute until cheese melts through the sauce. 5. Add the shrimp back into the pan, sprinkle with the herbs and parsley, and stir through. 6. Serve over pasta or rice.